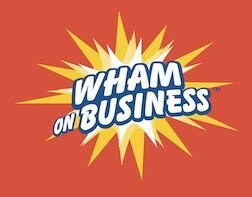 Wham on Business: Why Should You Go Into Your Own Business? So you can earn a fortune? Maybe you’re stuck in a dead-end job? But, better yet you have an idea - an idea that wakes you up in the middle of the night, an itch that you just can’t scratch. Entrepreneurs have a burning desire to create, to build something. And they have confidence in themselves. Entrepreneurs may be dreamers but they are generally not wild-eyed gamblers. Instead, they take, or should take, only calculated risks. 1) Have a high energy level? Because you’ll need every bit of energy you’ve got. 2) Possess a success background? Winners have a tendency to keep winning. Losers have a tendency to keep losing. That applies to business in spades. 3) Have a high tolerance for uncertainty? There are no guarantees in business, only good judgment decisions that oftentimes works out favorably. 4) Handle enormous stress appropriately and successfully? If you can’t accept that there will be many sleepless nights, stay working for someone else. 5) Have spousal or partner support? If you come home each night with a carping partner, these negative attitudes will drag you down and hurt your chances for success. 6) Have a well thought out and written business plan? Sure, luck can be an important aspect of any successful business, but it takes a heck of lot more than luck to win. 7) Have you strong leadership skills?. You’ll be the captain of the ship and in order to navigate successfully, you’ll have to have people around you who are willing to follow your direction. If you possess all or most of these aptitudes, you’ll have a better than even chance of building a successful business; one that will lead to personal satisfaction and the possibility significant wealth. Next week’s blog: What Is The Right Type Of Business To Start?